You're probably wondering what Spheniscidaeaphobia is and if you aren't wondering then you probably have it. This topic stems from the start of the 2009/2010 Thrashers & Hawks seasons. These seasons keep our mascot, Ping, fiercely busy shooting t-shirts with Thrash & Harry and dancing with crowds at Philips Arena. If you haven't met our fearless penguin leader, Ping, then shame on you... you need to get out more! These events intrigue me because the reactions to our loveable Ping are night and day. The 1st surprise I encountered was how much grown men and women LOVE Ping, I mean, I would expect small children to eat him up but the adults pleasantly surprised me. 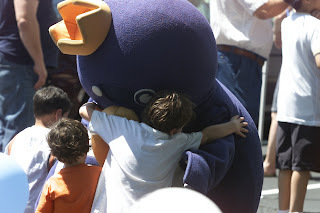 Which leads to my 2nd revelation, how some children are absolutely terrified of the plush bird. We had to set some mascot rules after some children screamed with terror when Ping approached them. Now, Ping must stand and only wave or attempt to give high five, but never, ever try to approach a child. The 3rd discovery was how much some adults choose to spend their time at an event, not to drink, eat and be merry, but instead to poke (sometimes literally) fun at a mascot. We realize that not everyone can embrace our Ping as this child in the picture did, but we hope that you don't have Spheniscidaeaphobia and avoid his company altogether. Just remember, the rules, he must be approached and you can always avoid eye contact to prevent interaction. Otherwise, expect to get a high five and maybe even a photo. P.S. In case you're still wondering what Spheniscidaeaphobia is, it's the fear of penguins... don't worry, ours won't bite.